Breakfast. Who has time? Am I right? If you can scrape up five extra minutes in the morning, then you do! We’ve always heard breakfast is the most important meal of the day because a healthy breakfast sets us up with energy to make it through morning traffic, work meetings, a workout, a kid who refuses to wear matching shoes, or whatever else the morning throws our way. A satisfying breakfast will energize our morning and hold us over, so we’re not ravenous by lunch. You may think you don’t have time to eat a proper breakfast and find yourself popping a toaster strudel on the way out the door, or running through the fast food drive through. I have some quick and easy breakfast ideas to help you make better choices to kick off your mornings on the right foot. Skip the boxed cereals and toaster waffles to get a more nutritious and filling breakfast to fuel your day. I’ll start by saying, a traditional breakfast is great, but don’t get too caught up on customs. If you want to eat leftover dinner or chicken breast and veggies for breakfast, there’s no reason you can’t. Just because it sounds weird, doesn’t make it any less healthy. It’s really about what works for you. It’s ok to think outside the meal. The most filling and satisfying breakfast will have a mix of proteins, whole food carbohydrates, and healthy fats. Mix and match the below breakfast ideas to find the right combination for you. Prepare ahead or in about five minutes in the morning. Healthier breakfast ideas for busy mornings on the go. Save to your favorite Pinterest board for later. Eggs are a healthy breakfast staple. Don’t be afraid of the yolks; yolks are full of healthy nutrients and the latest research show that the cholesterol in egg yolks has little effect on blood cholesterol levels in healthy adults. Hard Boiled eggs are the easiest way to eat eggs on the go. Place eggs in a pot and cover eggs in cold water. Heat on high until the water boils, then turn off the heat, cover, and let sit for 12 minutes. Rinse eggs under cold water to cool quickly and prevent continued cooking. Peel and store in the refrigerator for up to a week. If you have five minutes at home, crack a couple of eggs in a heated pan over cooking spray. Flip after a couple of minutes to cook the other side. Microwaved eggs are surprisingly delicious. Whisk the egg to completely break up the yolk (yolk will explode in the microwave if not broken, you’ve been warned). Place whisked eggs in the microwave for 45-60 seconds on high. Then add 10 seconds at a time until fully cooked. Be careful not to overcook. Egg muffins are an easy way to prepare breakfast in advance. In a lined muffin pan, whisk whole eggs and pour into muffin cups. Chop your favorite veggies: colorful peppers, mushrooms, tomatoes, jalapenos, onions, etc. and spread throughout the cups. Add cooked meat like bacon, sausage, ham, or turkey, if desired. Top with a pinch of shredded cheese to each cup. Bake in a preheated oven at 350 for 20-25 minutes or until firm. Once cooled store in the fridge for up to four days. Heat an egg muffin in the microwave each morning for a quick nourishing breakfast on the go. Do you love your fast food breakfast sandwich? Make a healthier version at home. Toast Ezekiel bread or a whole wheat English muffin, cook an egg as described above, add cheese and avocado to enjoy a healthier breakfast sandwich! Toast a slice of Ezekiel bread, spread a couple slices of avocado (about a thumbs size) and top with a cooked egg. Old-fashioned oatmeal is a healthy whole food breakfast option. Skip the sugar-laded packets and layer on the flavor at home. Start with plain oatmeal, flavor it with fresh fruit or berries and cinnamon and coconut flakes. Add plain Greek Yogurt or mix in protein powder for a protein boost. Overnight oats combine oatmeal, milk, yogurt, berries, and fruit for a quick, healthy breakfast ready to go in the morning. Add 1/3 cup of old fashioned 100% whole grain rolled oats (uncooked), 1/3 cup of milk, 1/3 cup of plain Greek yogurt to the bottom of a small pint mason jar. The topping varieties are endless: Add banana slices, peach slices, strawberries, blueberries, blackberries, cherries, crushed pineapple, coconut flakes, sliced almonds, cinnamon or whatever else sounds delicious. Leave the prepared jars overnight in the fridge and the oats will soften in the yogurt and a make a delicious fuss-free breakfast in the morning. Grab a spoon and go. 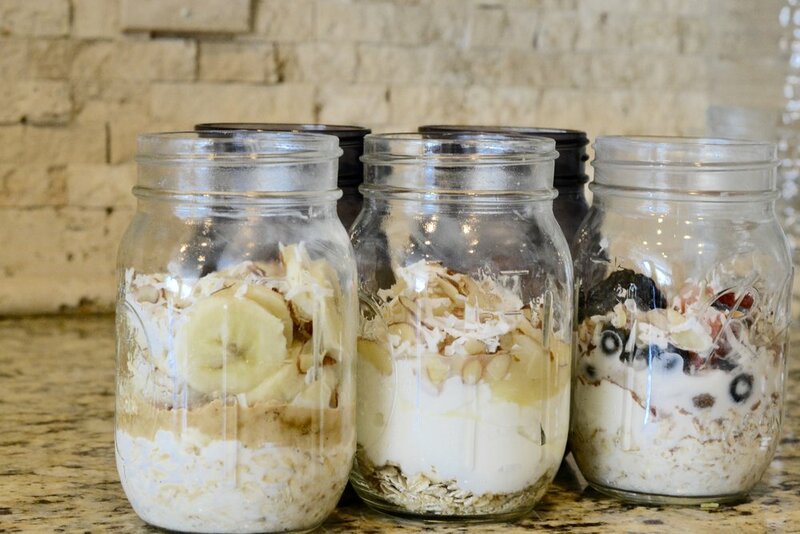 More overnight oats flavor ideas here. Prepare these flourless oatmeal-based muffins or these pumpkin flavored muffins over the weekend and enjoy all week long. They are so delicious you might forget they are healthy! Pair with a protein (like Yogurt or cottage cheese) for balanced breakfast. Think of plain Greek Yogurt as your protein base and flavor it with fruits and berries and homemade granola. It’s much healthier to add fruit or berries to plain yogurt than to buy high sugar yogurt cups. Regular plain yogurt is fine as a base too, but Greek Yogurt is higher in protein. Cottage cheese is high in protein and is delicious when paired with flavorful fruits and berries. My favorite combo is a 1/2 cup of cottage cheese with a spoonful of crushed pineapple topped with homemade granola. While I usually recommend whole foods, a protein powder shake can be an easy way to get in a healthier breakfast on the go. Add fresh spinach greens (you won’t even taste them) to the bottom of the mixer cup, top with fruit or berries and protein and blend with a little milk or water for a delicious breakfast to drink on the go. Check out this blog post for some protein shake flavor combinations ideas. Breakfast doesn’t have to be complicated or time consuming. Try one of these breakfast ideas in the morning to start your day off on the right foot. Did you like this post? Do you know someone who might benefit? It helps me when you share with your friends and followers on Facebook, Twitter, or Pinterest.